Greetings and happy weekend everyone! 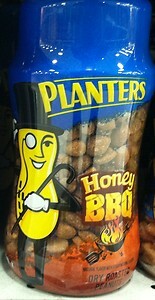 If you are looking for a snack that has more substance the chips, perhaps more protein without being greasy, look no further than new Planter’s Honey BBQ Dry Roasted Peanuts, and Planter’s Roasted Onion & Garlic Dry Roasted Peanuts. I specifically say chips, because these are flavors most often associated with potato chips. One of the nice things about these nuts is that the flavors are not super assertive–a good thing if you plan on eating more than a few handfuls. This is also a drawback if, say, you like big and bold flavors. The Honey BBQ flavor taste like honey roasted peanuts a bit–though not as sweet, and with a background flavor that resembles the barbecue seasoning on, well, barbecue potato chips. For me, the flavor was just too subtle. Of course, my nut of choice in this case would more likely be the spicy ones, a la Planter’s “Heat” nuts. The Roasted Onion & Garlic peanuts were more flavorful and had a really nice savory flavor profile that was also mellow and subtle enough, but with just the right amount of onion and garlic punch. The thought here is maybe that real roasted onion or garlic is more sweet than harsh. If you have ever had Wise brand Onion/Garlic chips (do they still make those? ), that’s what these nuts taste like in reference to snacks I’ve had before. And I did like these more than the BBQ ones. It’s summer and time for outdoor barbecues and just lounging around outside, and these Planter’s peanuts will definitely be a nice addition to your snack pantry for these occasions. Well, last month they announced the winner, Cheesy Garlic Bread, submitted by Karen Weber-Mendham of Wisconsin. I live in Wisconsin, and I love cheese, but this one was my least favorite of the three. I’m not sure who came in second and third, but I liked the Chicken & Waffle the best, followed by the Sriracha. Oh well, I guess in the end most of the country is more likely to opt for a flavor that is classic and a tad more common and old school of an idea. And that’s okay. Or maybe those folks genuinely liked the Cheesy Garlic Bread the best, and that’s okay too. But the reality that I’d never get to have those Chicken & Waffle chips again kind of bummed me out. Have no fear, the Frito-Lay publicist told me, however. She sent me a bag of the Chicken & Waffles (as well as two more bags of Cheesy Garlic Bread…ha! ), and told me the other two flavors might be making an appearance on shelves for a limited time this summer. 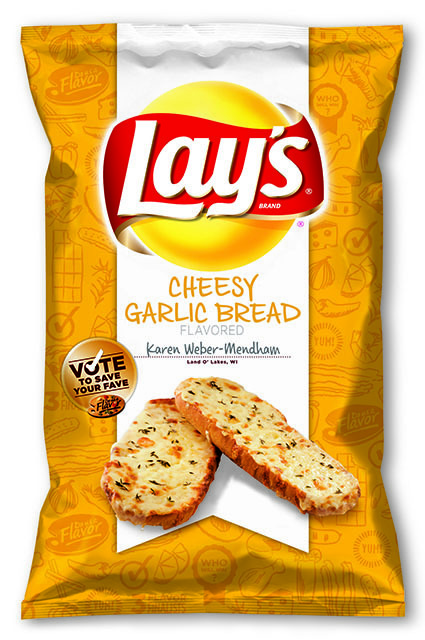 Lay’s sure has the marketing to this down, because in the end they may satisfy all palates with this contest. And I’m already thinking about a flavor I could submit next year. How about you? What are your flavor ideas? Quick, what is the first thing that pops into your head when you think of chia seeds? 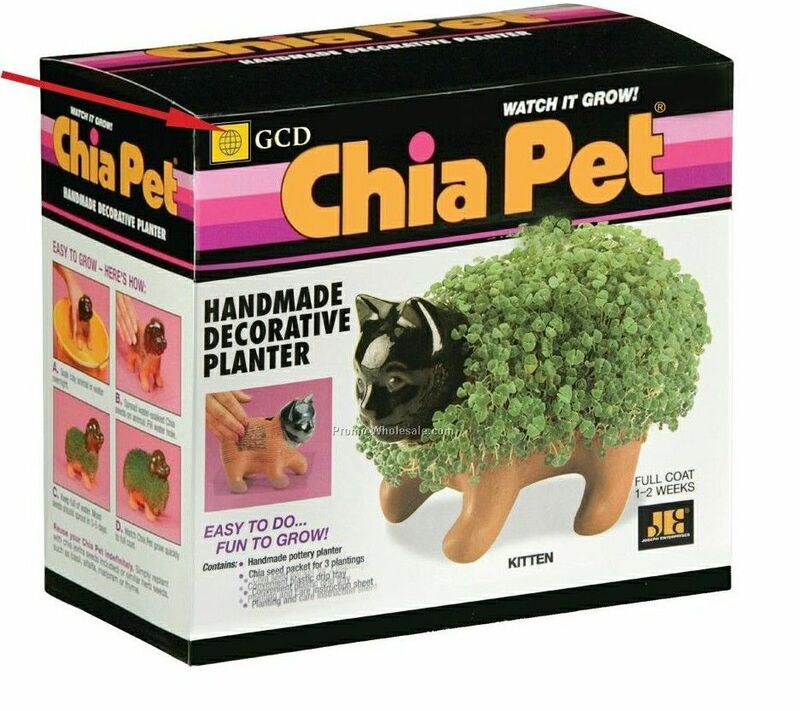 Yes, that commercial for Chia Pets that maybe you saw during late-night TV. But apparently chia seeds have a significant health benefit, as in Omega-3’s and fiber. And Mamma Chia, a juice/smoothie hybrid type drink/snack is a portable and tasty way to get your Omega 3’s, especially if you do not like fish or the idea of taking fish oil capsules. I must admit I was skeptical at first when Mamma Chia was pitched to me, but for the most part I am adventurous with new products like this, so I offered to try it and write it up. There is no need to refrigerate the product, as it’s basically one of those portable juice squeeze bag type things that are all the rage right now, especially among kids. But I refrigerated mine and tried them all this past weekend when it was a wicked hot and muggy Midwest day, and not only was Mamma Chia refreshing, but they all tasted pretty good, some more than others. The grainy texture of the tiny seeds also had a somewhat pleasant mouth feel, sort of the way sprinkles on ice cream does. Green Magic–I’m a sucker for these “green power” type things, because it’s an easy way to get the nutrients in like four bunches of kale easily without eating all that roughage. And this one was slightly tart, not as sweet but not bad at all. Strawberry Banana–This was a thicker consistency, and the berries were more dominant than the bananas but still tasty. Apple Cinnamon–My favorite flavor, it tastes like apple pie. Yum. Blackberry–This one was more watery, but not too tart nor sweet. And the added bonus? I took them out and told my wife that I read about Mamma Chia online, and that it’s a hair growing remedy just like the old Chia pets. I think she believed that for about half a second, but it is still funny to say that and I’m sure I am not the first person to joke about it. But hey, Mamma Chia is something I’d highly recommend–have it on hand in your desk, briefcase, home, or car. It’s a tasty, easy way to get some important nutrients. It seems like every week when we visit Trader Joe’s for a family grocery shopping experience, there are new products that catch my attention and somehow become pulled by gravity into the shopping cart. This can be good and bad–good because more often than not, it’s something delicious and unique or both. Bad because it’s typically something we want to eat and not stop eating. 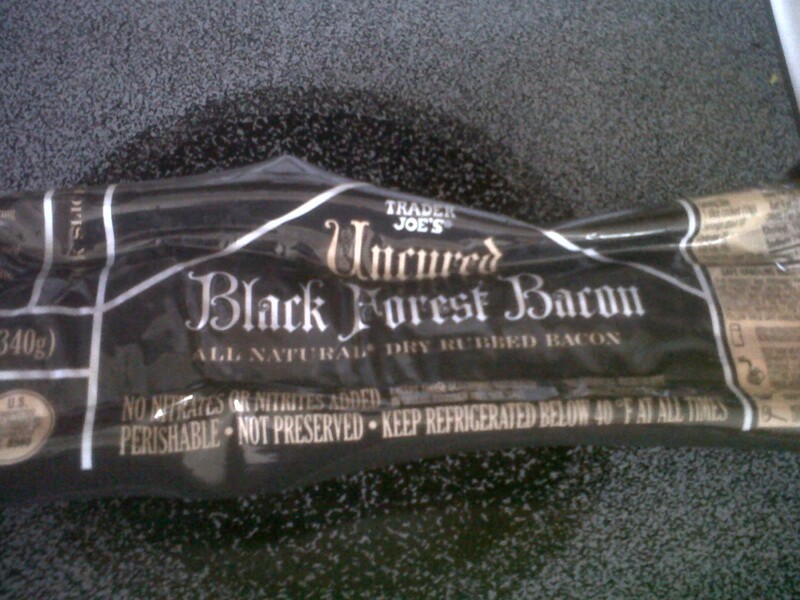 Such is the case with Trader Joe’s Black Forest Bacon. You know what’s crazy though? There is almost no information on this stuff online. It’s like they are sort of trying to keep it top-secret. Which is fine, because that means more for me and for my wife. But mostly for me (shhhhh). I did find this contest on Food & Wine and while there are some TJ’s bacons on here, I don’t have to try anything on this list to know that the Black Label will whip their bacon asses all up and down that page. Why is it so good? Well, it crisps up beautifully, meaning it’s tender and the fat becomes something of a liquid pork rind (which is, well, what it is), and the bacon slice itself is bursting with flavor and crispness. It also has no fake taste whatsoever, as it’s real smoked and uncured and has a nice dry rub, but it’s even more remarkable that even if you slightly burn it (which you almost have to to get it crisp), it doesn’t even taste burnt. I don’t know how they do it, but they do, and they do so in my house almost every day lately. We now buy two packs at a time, and might ramp up to three this weekend. I mean, you never know when you will have a bacon emergency, right? Being a K-Cup ambassador has surely opened my eyes (literally) and taste buds up to new and exciting flavors and varieties. There have been a few duds along the way, but for the most part, the items that the fine folks at Green Mountain have sent have been stellar. 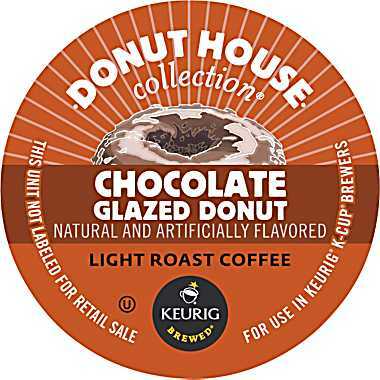 In February, they delivered a sample pack of Donut House flavors–which included plain, chocolate glazed donut, cinnamon roll and decaf. The plain is very similar to the delicious coffee you might find in a donut shop–and I’m not saying that to be snarky! The cinnamon roll has a subtle, slightly sweet twist, and the chocolate donut has a nice chocolate undertone without being overpowering, but it’s a bit more than subtle as compared to the cinnamon roll. The decaf? I’m one who believes that coffee should be consumed to help me wake up, so the decafs are still sitting in our kitchen. 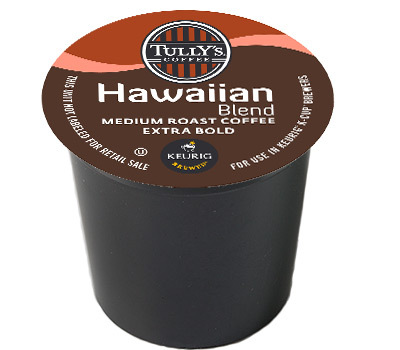 March brought Tully’s Hawaiian Blend, and while I’ve never been to Hawaii, I imagine that the coffee there is always delicious (I also imagine shoe leather would be delicious against the backdrop of Hawaii, but I digress). This Hawaiian coffee is a darker roast but not too dark, and it has a hint of sweetness. It’s definitely one of the better ones they have sent so far. * More people know about and own single-cup brewing systems, like the Keurig: 86% have heard of these, while ownership has grown to 12% from 10% last year! With more than 200 options for coffee, tea and other beverages it’s easy to see why!